A University of Pittsburgh researcher and a U.S. subsidiary of a Korean chipmaker announced Thursday they plan to sell radio-frequency identification tags to get a share of what could be the biggest change in retail technology since the barcode. ADCUS Inc., a subsidiary of Advanced Digital Chips Inc., plans to market a generic "smart tag"' developed by University of Pittsburgh electrical engineer Marlin Mickle, who has said his "Product Emitting Numbering Identification" tags are smaller and cheaper to produce than other smart tags -- hence the acronym, "PENI" (pronounced "penny"). Mickle and Wexford, Pa.-based ADCUS said they want to help speed the implementation of the "smart tags''-- tiny radio transponders made of microchips and mini-antennas and known as RFID -- by making them cheap enough for smaller businesses to buy and use. "Companies would not have to pay to create these generic chips from scratch," Mickle said. "Instead, they would just buy them as ready-made commodities. They could then customize these chips, or pay a programmer to customize them, to meet their own specific needs and those of customers." Mickle and other University of Pittsburgh researchers have patented a 2.2 millimeter-square chip with a tiny antenna etched onto its surface. Mickle has said the tags -- which are passive, meaning they only bounce radio waves back to transmitters -- could cost between a nickel and a dime to make. Mickle said ADCUS could begin selling more advanced and active chips, which would broadcast all the time, within three years. If successful ADCUS could cash in on growing interest in RFID technology, which could grow from a $1 billion industry last year to $3 billion in 2007, according to the Wireless Data Research Group. Retail giant Wal-Mart and the U.S. military have required their suppliers by next year to begin using the smart tags, which have been touted for their potential to speed up checkout lines, control inventory, cut costs and reduce theft. Other retailers such as Albertson's, Best Buy and Target as well as drug makers such as Johnson & Johnson, Merck & Co. and Wyeth are also looking into the tags. While the tags could help retailers save money by smoothing out their supply chains, the cost of the tags themselves could keep them off store shelves for some time. Wal-Mart's top 100 suppliers -- including Black & Decker, Gillette Co. and Proctor & Gamble -- have been scrambling for the past 1@1/2 years to ship RFID-tagged products by January; analysts have estimated the companies will spend $2 billion trying to meet the retailer's deadline. Analysts have said the radio tags would have to cost no more than a nickel before they're used widely; last year the average price ranged from 57 cents for a passive tag to 91 cents for an active tag, according to the ARC Advisory Group, a research firm in Dedham, Mass. A recent report by ARC predicted that the least expensive tags would fall to only 16 cents by 2008. ADCUS would also be going head-to-head with technology stalwarts such as Alien Technology, Hewlett-Packard, IBM, Microsoft, Sun Microsystems and Texas Instruments. But ADCUS is confident it can sell or license the RFID tags to businesses that may not be able to afford buying or developing the technology today, said Bill Choi, vice president of business development. Choi said he couldn't estimate how much the new tags would cost. The tags are envisioned as brainier bar codes; they can hold much more information, can relay information faster and don't need to be passed under laser readers. 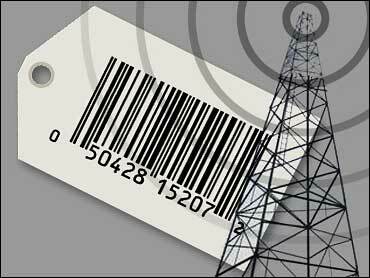 The tags talk with scanners using radio waves and relay information stored on them. Advocates say the technology could result in consumers spending less time in line, because whole shopping carts could be "scanned" rather than one item at a time. Items could spend less time in warehouses or on store shelves because retailers could quickly check and manage inventory. Privacy advocates worry the tags could be used to collect personal data and even track people's movements. Mickle has said his "smart tag" could eliminate such concerns because it could be disabled when an item is sold, much like anti-theft labels used on CDs or electronics.